Today was day 2 in trying out my new Merrell Pace Gloves. Actually, I've been wearing them to school the past 2 weeks, but I haven't run in them until yesterday. Run #1 was yesterday. I took them out for the 1st mile of my 4-miler, came home changed into my Brooks St5's for the remaining 3. I really could have gone a little further in them yesterday, but I was still feeling a bit sore from B2B and didn't want to overdo it. 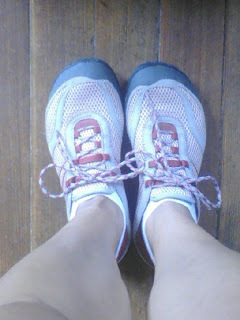 It was funny how I felt like my Brooks were so soft after the Merrells- they actually felt like pillows. Other than the achy calves and quads I felt before the run, I didn't feel any ill-effects from run #1. Run #2. I wasn't going to run today. Today is scheduled to be a cross training/yoga day. I did do my yoga, but I was feeling quite overwhelmed, so therapeutically I had to get out for a run. I only went out for 3 miles and it wasn't a fast one. But I did take the Merrells out again. I know you are supposed to start out slowly with them and I don't want to overdo it. But they are so much fun, so I just went for it! While running, I felt great. Not tightness or pains at all. I am scheduled for a 7 mile run tomorrow, but I don't think I'll push my luck with the Merrells. I think I'll save them for the next shorter run and stick with my Brooks for the longer runs. You have a great blog buddy. Keep writing this informative content.